Most of you appreciate patterns, but not all of them are equally relevant, and some patterns may even turn out to be coincidental. When you're finished reading this article, you will know exactly which price and market patterns have the most relevance when trading within the market structure. 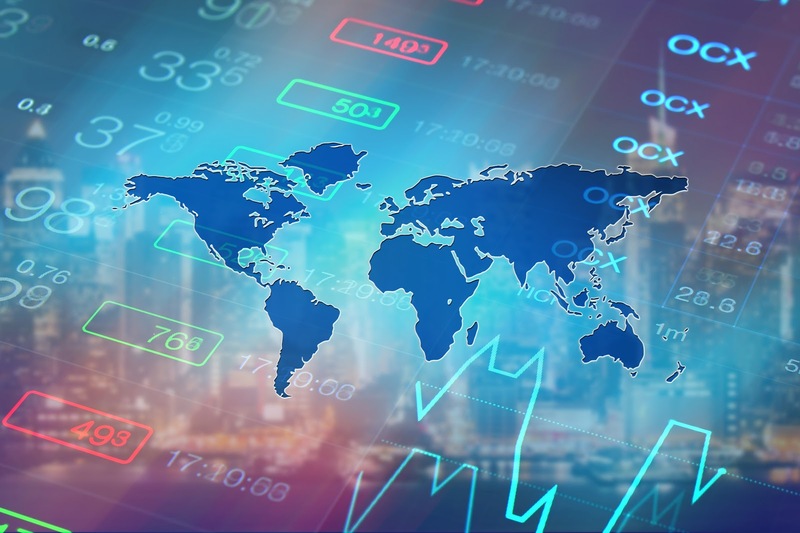 This article will provide a full overview of which patterns are useful and beneficial for Forex, CFD, and commodity traders. How to Differentiate Relevant and Non-Relevant Patterns? In the world of technical analysis, there are tons of established patterns visible on charts each trading day and week. Why? A pattern is simply a regular repetition of the price movement. Chart and candlestick patterns are two popular examples, and we'll dive into many of them in today's article. Please mind that not all patterns are mentioned here, which doesn't qualify them as less respected pattern formations. You might discover how the AUD/USD respects the 50% Fibonacci level after a trend line break, which is a valuable pattern to know. Some patterns are not as useful. For instance, a trader who sees a pattern of the EUR/USD moving lower after their favourite football team loses is being a bit too creative. The two variables 2are obviously not correlated to each other. 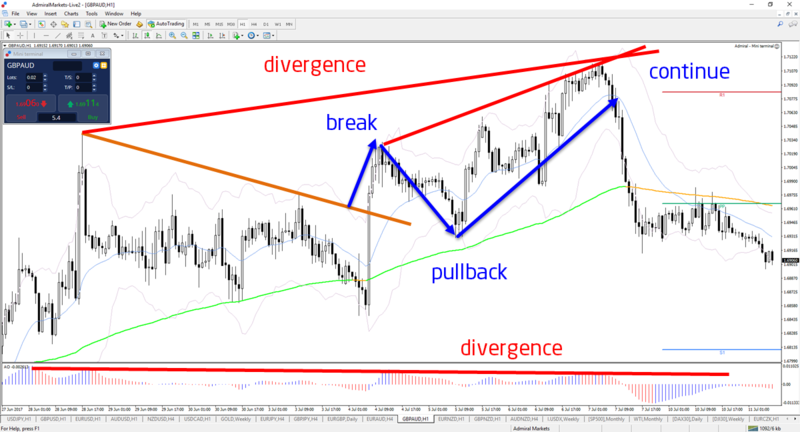 In this article, I will discuss my favourite patterns that I use when tackling the markets, which are also used in the live trading webinars (see below). Seeing the correct trend and direction: Strong bullish or bearish weekly candle, for instance, can indicate a trend continuation next week. Trading bounces and reversals: Candlestick patterns at support or resistance could confirm a potential turnaround. Measuring breakouts: A strong candle closing near a high or low could show that the price is breaking below support or above resistance. Candlestick patterns are my favourite method for confirming an anticipated trade in my decision zone. 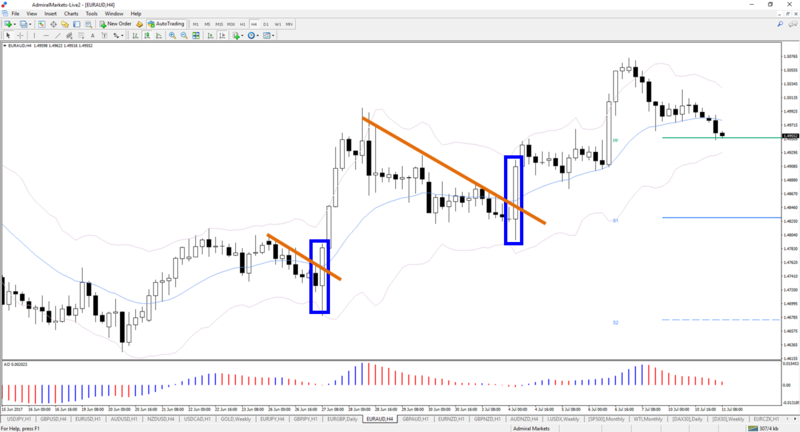 In the image below, you see engulfing twins (blue boxes) break above the resistance trend lines (orange), which, in fact, represent examples of chart patterns (bull flag). This is our next focus. Source: MT4SE platform showing EUR/AUD, 4-hour chart from 15 June to 11 July 2017. Is price action showing a reversal or a continuation? Is price action bullish or bearish? Continuation: Bull flags are considered to be bullish continuation patterns, whereas bear flags are logically bearish continuation patterns. Reversal: The head-and-shoulders pattern is a famous bearish reversal pattern, whereas the inverted head-and-shoulders pattern is a bullish reversal example. Other examples of reversal patterns are rising (bearish) and falling wedges (bullish). Fibonacci levels work best when the market is trending. The price can bounce and retrace to multiple Fib levels before the trend continues. The price usually goes to the Fibonacci target levels as well. Simply said, the Fibonacci levels provide excellent value for entering and exiting the market, but it is important to understand the tool in more detail first. It is not recommended to use it for signals without properly applying the tool. Source: MT4SE platform showing GBP/JPY, 4-hour chart from 6 June to 3 July 2017. 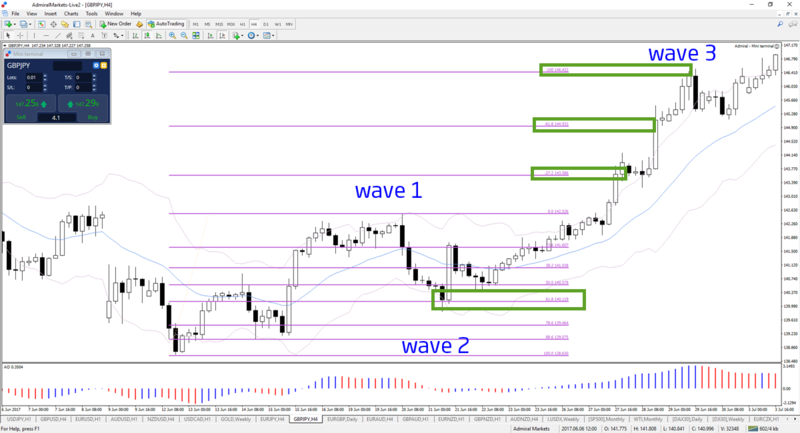 The Fibonacci levels go hand-in-hand with wave patterns. The Fibonacci levels are best-plotted on a swing which is considered to be one piece according to the wave analysis. The Elliott Wave Theory also helps traders understand the market psychology in general and what type of price action could be expected with the next price action swings. In an uptrend, downtrend, or range. Quick (impulsive/momentum) or slow (corrective). Divergence patterns are the important warning signals for the end of the trend. These patterns often are an early sign of an upcoming reversal. This is especially true if there are multiple diverge patterns on one time and/or multiple divergences on multiple time frames of the instrument. Source: MT4SE platform showing GBP/AUD, 1-hour chart from 27 June to 11 July 2017. Price action often builds a BPC pattern at the trend line. The BPC stands for Break, Pullback, and Continue and often occurs when the price manages to break a trend line. I am a huge fan of drawing trend lines on my chart to see where the major channels as well as the key support and resistance lines are located. As the price is approaching them, I am always on the lookout for BPC. Last but not least, time patterns. Price action is of key importance to understanding momentum, correction, candlestick patterns, and chart patterns, but the second part of the chart is also relevant – time. There are more than a dozen time patterns, such as the expected market movement during the various trading sessions of the day. My favourite method is, however, counting candles, since a new high or low is visible on the chart. Lack of a new high or low within 5 to 6 candles often reveals the potential for a correction or reversal. Find out more information on this time pattern here. Also, feel free to test Admiral Markets' MetaTrader 4 Supreme Edition – a special plug-in with 60+ extra features to tackle the markets including a package of extra indicators.